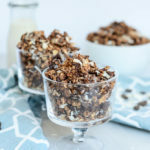 A classic granola recipe gets a decadent makeover with the addition of antioxidant-heavy dark chocolate and toasted coconut. Preheat the oven to 310 degrees Fahrenheit. Line a large jelly roll pan with parchment paper and set aside. In a large mixing bowl, stir together the oats, applesauce, maple syrup, cocoa powder, cinnamon and sea salt until well-combined. Spread out evenly on the prepared jelly roll pan. Place the pan in the preheated oven and bake for 20 minutes. After 20 minutes, give the granola a stir and set the timer for 5 more minutes. When the timer goes off again, add the flaked coconut and stir the granola again. Return to the oven for an additional 15 minutes. Remove granola from the oven and add the dark chocolate chips to the pan, stirring to spread them out evenly. Let cool to room temperature before eating.